When the round is over, you're sure to be hungry. 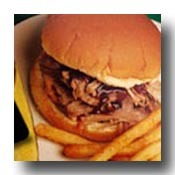 Let carolinagolftravelguide.com help you find the best restaurants in the area. From fine dining to causal settings or even sports bars, here are the hotspots you're looking for. So after birdies during the day, don't make bogies at night. There are over 250 Restaurants on Hilton Head Island. From gourmet dining to fast food, there is a taste and budget to suit everyone. Hilton Head is a great place to enjoy outstanding seafood. Find oysters,crab, shrimp and fresh Atlantic fish in any one of the several seafood restaurants located on the island. Italian,Mexican,Asian or just a good old fashioned burger and fries, whatever your choice you are sure to find it on Hilton Head. The Dunes House at Palmetto Dunes offers the perfect place for resort guest s and property owners to experience the best of the beach. Adjust your attitude at this laid-back island destination and enjoy the sand, surf, sun and spectacular views of the Atlantic Ocean. Open for lunch and dinner, the Dunes House offers a casual menu featuring local seafood, handmade burgers, grilled chicken, gourmet salads and other tasty treats. A wide range of beverages are also available, from beer and wine to sodas and signature frozen drinks. Red Fish specilaizes in cuisine where a unique blend of housemade spices, tropical fruits and vegetables – give each dish a Caribbean flair. The restaurant has an extensive wine list; and diners may also browse the on-site wine shop with more than 1,000 bottles to choose from. Their knowledgeable wine staff can help you choose your selection any time of the day or evening, to be purchased or enjoyed while dining. Red Fish is a retail wine shop and a restaurant, a unique concept to Hilton Head! If you are hungry for some excellent prime rib, Crane's is the spot. Crane's Tavern was founded in Philadelphia at the turn of the century by Frank Crane, an Irish immigrant. Crane's closed its doors during prohibition and reopened in 1933. It was subsequently operated by his sons Francis, Edmund and Robert. Francis' son, Tom, then operated the establishment until 1973. Francis' other son, Hank, left the family business to open Crane's Tavern in Ambler, Pennsylvania. In 1972, Hank purchased the Surf City Hotel on Long Beach Island, New Jersey and created another establishment with the Crane namesake. Hank's daughter, Beth Anne, managed the hotel until it was sold in 1998. 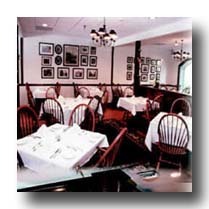 In April of 1999 she and Hank opened Crane's Tavern and Steakhouse on Hilton Head Island, South Carolina, continuing the family's tradition of serving great quality food and drink for a fair price. Only the best Prime Beef is served and a carefully crafted wine list is offered to the customers. New to the island, but not new to rib and barbecue aficionados, Sticky Fingers has been serving the Lowcountry's favorite ribs and pulled pork barbecue for over a decade. Private banquet space with bar available for your next meeting or special occasion. Sticky Fingers also offers their award-winning menu items in bulk quantities so you can serve our "fall-off-the-bone delicious" ribs with all the fixins at your place without the hassle!